Chef Shantanu tosses up a sumptuous and colorful Caeser Salad and the best part is that this one is Vegetarian. Caeser Salad is one of the most tempting, delicious and nutritious salad with its colorful vegetables, crunchy lettuce and crispy croutons. So let's toss it up! - Add chopped basil leaves, crushed black pepper, salad dressing and mix everything well. 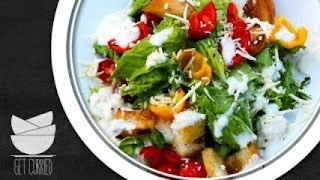 - Sprinkle some grated cheese, freshly grated black pepper and some more salad dressing and the salad is ready to be served.